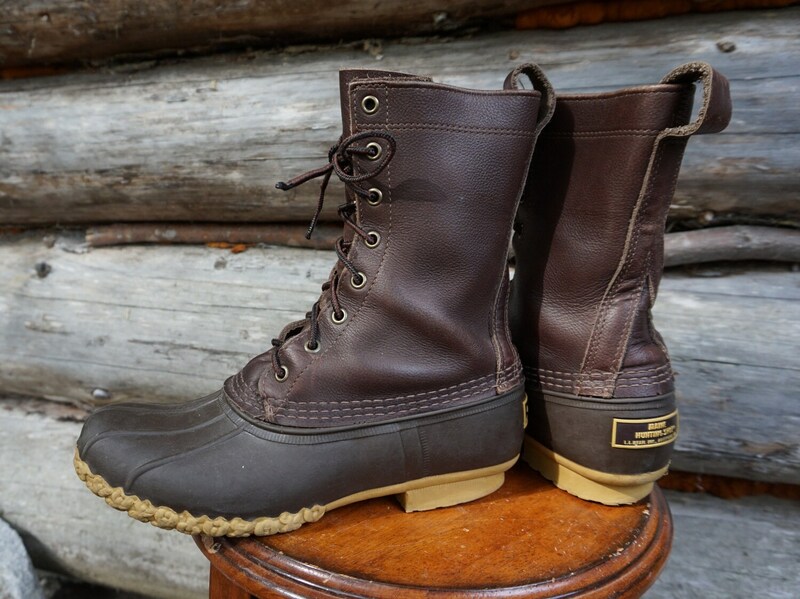 The "Maine Hunting Shoe" has been a timeless classic for decades! Vintage style and quality to spare! Made to last by L.L. Bean in the USA. Brown leather tops and darker brown rubber bases. Unlined version, great with a pair of cozy socks. Perfect for the rain, mud, and slush. Condition: Very good condition with only very minor wear. X on the tongue, so these were store returns. Size: NOT MARKED. I would guess they were a US 9 Men's or US 10 Women's (unisex style) Please use the measurements below to determine fit. Measurements: Removable insole is 10 1/2 inches long by 3 3/8 inches at the widest point. Outer sole measurements 10 3/4 inches long by 4 1/8 at the widest. Boots are 10 inches tall from the ground.